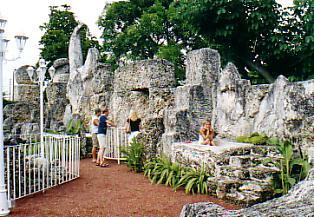 The Coral Castle is not actually in the Florida Keys but it is only a few miles north of Key Largo in Homestead. This is a tourist attaction that I heard about years ago. 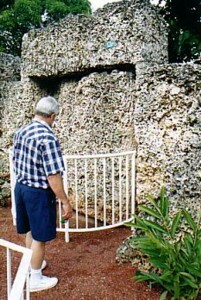 My father-in-law was also fascinated by the stories about the construction of Coral Castle, because it was done by an eccentric man who quarried the coral and put the pieces into place all by himself using only simple tools that he made himself. A story was spread that he couldn't have done it himself so he must have had help from space aliens or that he had invented an anti-gravity device to lift the coral slabs. The nine ton slab that can be pivoted with an easy push by hand amazes visitors. The pivot mechanism had to be replaced a few years ago and it took a crew of several men with a crane to lift the pieces and replace the pivot. The gift shop has photos of the men reworking the door. It certainly was an accomplishment for a man (and a small man at that) to be able to do that single-handedly. Here is a happy tour guide who was very helpful with our questions. She said she is studying pharmacy. She said that tourists tell her she should be studying some scientific subject since she is working in such a scientifically unusual place. Ann, Francis, and Ray pose at the entrance and you see the entrance from the opposite side. There in the corner of the walled area is the little two story quarters where he lived and did his work. This is the central area of the 'castle' as viewed from the top of the stair leading to the second floor of the tower. Two young couples from Russia were touring the castle. In this photo, one of the young women has climbed into the bathtub while the others look at the pivoting door. I decided to keep these images small so that you will want to go check it out for yourself. 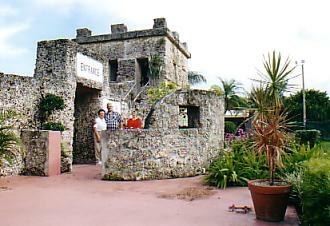 Ray, Francis, and Ann look at another part of the castle. The castle is in private hands and the story about that and about the man who built it is very interesting. Entrance fees help maintain the place. Tourist guide books usually have discount coupons. 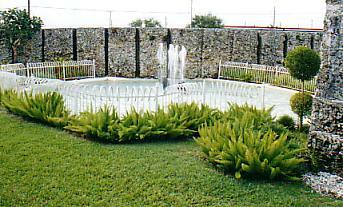 This fountain and landscaped area is just outside the castle walls. This area of Florida is basically an ancient coral reef. 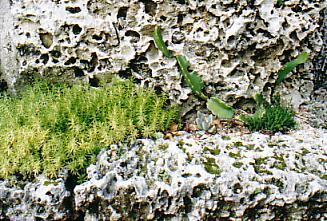 Plants growing in the crevices of the coral. Much of the coral was quarried just outside the castle. 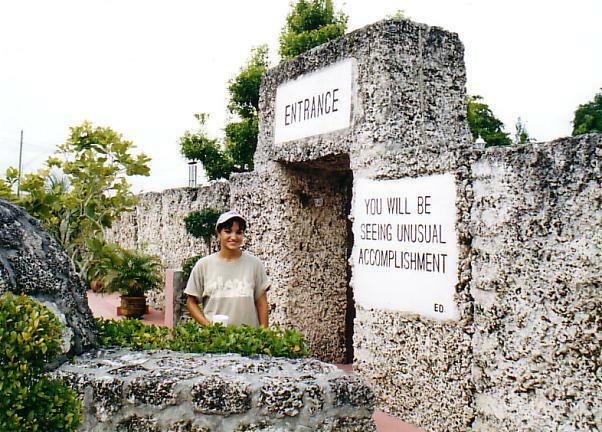 This is the nine ton revolving coral door. 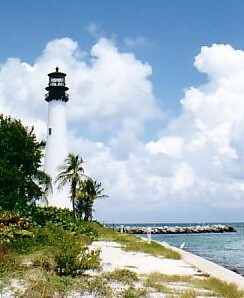 This is a lighthouse on the coast somewhere around Miami Beach. It was closed for refurbishment. 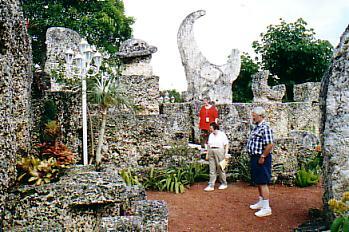 Coral Castle Home Page - Now go to the Coral Castle web site to find out the rest of the story. 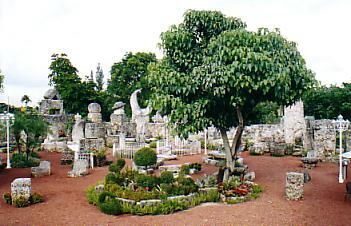 "If you had visited Coral Castle 60 years ago, you would have been greeted enthusiastically by a man weighing a mere 100 pounds and standing just over 5 feet tall. He would have asked you for ten cents admission and introduced you to his fantasy world carved out of stone." Learn about Ed. See more photos. Get directions and other information. Sign their guestbook. Anti-Gravity Theory - This page has more photos and another look at the story. It has an anti-gravity theme and speaks of Diamagnetic Vortex Points. More Florida Keys Photos - These pages have photos of Fort Jefferson on the Dry Tortugas Islands in the Gulf west of Key West.